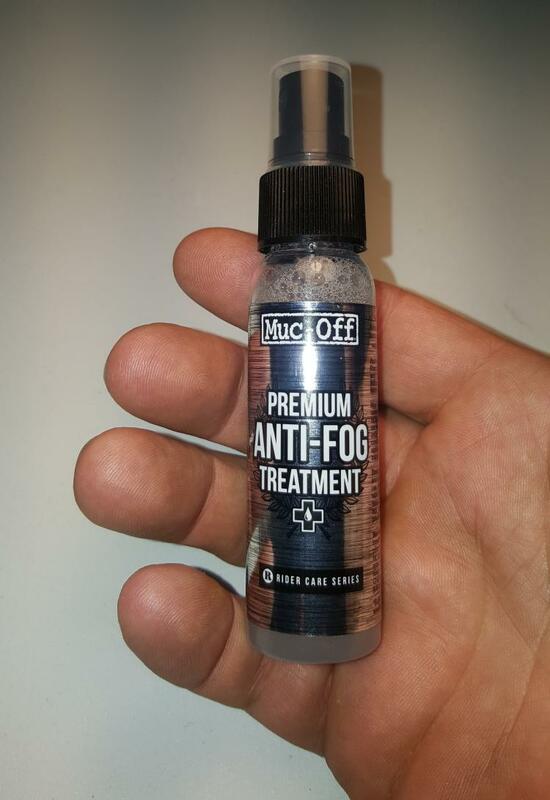 I know Sharon likes her Muc-Off stuff, whilst at the bike show I picked up this little tube of Muc-Off Premium Anti Fog treatment. No sure why its called premium. However it was £ 7.99 reduced to £ 2.99 at the show - limited quantity available. At this time of year breathing in my hermetically sealed rubbish helmet produces a lot of fog. A quick spray of this stuff on the inside of the visor and it significantly reduces the fogging effect to virtually nil. It fogs and disappears almost instantly. its not perfect as after a few minutes instead of fogging you get small droplets of water forming but its certainly better than before. I tried it on the outside of the helmet as it seems to spread and let water slide off. This works a bit but when it rains the drops seems to stay until they get big then slide off in one go. Overall I would recommend it seems to do the job. I am tempted to try the cleaning products now. Maybe a Muc-Off convert? I suffer less from this complaint than most as I use an open face helmet plus visor which are far better ventilated. However, the best stuff I have found for demisting is Rain-X anti mist - a liquid which you just spread around the inside till it dries (perfectly clear). NOT to be confused with "original" Rain-X which you put on the outside and it allegedly causes the water to bead up. Not that well IME. The best stuff for this I've ever used is Pledge furniture polish (use the lemon variety if you like the smell). A brief spray over the outside of the visor, spread it around with a soft cloth then polish to a shine. At any speed above 10 mph or so just tilting your head to the side sees the water stream off. Works very well for getting dead insects off as well. Did you just swear on my website Ian?!? We'll not have you using the "po!15#" word on here. Now go and wash your keyboard out with soap and water. I find washing the visor with washing up liquid then smearing a watered down layer of washing up liquid around the inside does a great job of stopping the fog. The key is watering down. Too much and the effect is soon lost. Too little and the washing up liquid leaves a hazy smear that doesn't help. Ventilation is key though. I hate full face helmets that are too close to my mouth. I have a rule when trying a new helmet. I should not be able to reach the chin piece with my lips or tongue. That way there's always breathing space. Just an additional note. I have changed the way I put on the anti mist stuff. I was originally spraying it on and spreading it around with a bit of tissue. This did work but what I do now is spray it from further away so its a much finer mist. leave it a couple of minutes then gently rub it around with kitchen towel. This works much better, I think its the finer mist. In addition I have also tried the washing up liquid and the pledge and I must say the pledge on the outside is a great tip. Ians quite right spray on rub in until it disappears and sure enough water just runs off seems pretty effective. With my screen it means if I lean to one side my visor goes in the air stream and all the drops fly off. Must try the Pledge trick. Tell me Ian - do I need to use Pledge or will El-Cheapo furniture polish work. Remember I'm a very poor person you see. I have heard it said that Mr Sheen is slightly better but I still have half a tin of pledge so I'm not throwing that away. A POUND! Oh my I feel faint.